It was seeing her mother, Deirdre, walking the catwalk in their hometown of Cookstown, Co Tyrone that sowed the seed in Kate Grant. The model, now 20 years old and a brand ambassador for Benefit Cosmetics, soon after told a teacher of hers that she would become a model. "And guess what? I did!" The model, who has Down Syndrome, certainly seems primed for even greater success. Her appearance alongside her mum on The Ray D’Arcy Show stole hearts, with her enthusiasm, warmth and glowing confidence emanating from the screen. Having just been unveiled as one of makeup giant Benefit Cosmetics’ brand ambassador, Kate spoke with passion and sincerity about the need for inclusivity and diversity in the fashion industry. Her first gig as a model was for Belfast Fashion Week, which came at the help of family friend Clare Martin, who cast Kate. Speaking to RTÉ Lifestyle about the experience, Kate said "I never expected it at all", adding "I thank God I’m here and I loved the audience". Since then, she’s pursued her career with astounding drive, having been crowned champion in the Teen Ultimate Beauty of the World Pageant and appearing on This Morning on ITV. Despite her comparatively short tenure in the fashion world so far, Kate is making savvy use of every and all avenues available to her. With 33,000 followers on Instagram, she frequently shares behind the scenes shots, letting us follow along on her Benefit photo shoot and as she preps for her appearance on The Ray D’Arcy Show. "Social media is so important to me. I want to say thanks to my followers and my fans, I love them so much. Keep following, please!" Her ambitions are equally grand: "I’d like to go model in London, Paris, Milan, New York Fashion Week. I want the public to ring the designers for me [to get gigs]." As well as this, she plans to be on the cover of Vogue magazine, perhaps alongside her fashion role models, Gigi and Bella Hadid. "I love them, I love the hair, makeup, I love them on the catwalk." Listening to Kate talk about her career, it’s abundantly clear that these plans aren’t roadmaps or speculative sketches like many young people dream up for themselves. She speaks with incredible authority over her own life, with clear focus and vision. Nowhere is this more clear than when she discusses her advocacy work, which goes hand in hand with modeling for her. When she thinks about her career in ten years’ time, she focuses on "my campaign for awareness for people who have disabilities, [promoting] inclusion and spreading awareness for people with disabilities", as well as getting those covers and working with Bella and Gigi Hadid. "I never let [Down Syndrome] hold me back, I keep going as a model." This factors into how she uses social media, as well, which is behind much of the publicity she’s generated around her career. "I created a lot of support on my Instagram and my Facebook for people who have disabilities", she said. "Even though I’ve Down Syndrome I still keep going. It doesn’t define me. I’ll never give up my dream, I want to give [it] my all." Deirdre’s influence is clearly integral to Kate’s approach, from that first seed of inspiration when she walked the catwalk to how she currently works as her manager. From helping her practice her catwalk to lining up jobs and contacting companies on her behalf, Deirdre works to show the world "the superstar she already is [at home]". "There’s a lot of organisation that has to go in into going to an event and I’m there to support Kate, emotionally and physically in all of her needs, from whether she’s hungry, whether she’s worried, just being basically a mum and ensuring she knows I’m there to manage a situation", she explains. "In saying that, Kate can be very independent, too", she adds. "She’s now at the stage of knowing what the job involves and she knows how to do and when to do it. She’s becoming that professional model." To watch any child dive into an industry with a reputation as simultaneously glamorous and sinister as fashion would be worrying, but when your child also has a learning disability the concerns would understandably multiply. Deirdre recalls her concerns even now. "Initially I was very apprehensive because of the fact that Kate didn’t fit the typical model mold but when I see how dedicated she is to be a model, she finds plenty of tutorials on YouTube, she’s watched every fashion look", she says. "When a child goes to those lengths, it made me realise that she was totally committed. Then I also realised that Kate being different, that’s what makes her a set apart from the rest of the models." It helps, of course, that Kate seems to be made for the role. "Once she gets on the catwalk, she’s just born to be there, she loves the reaction of the crowd, she loves the lights, she loves the music", Deirdre says. "She gets this lovely reaction from the crowd, she gives so much back to the crowd. Not just on the catwalk but individually as well, she loves meeting and greeting people. She just seems to love her followers and has plenty of time for her followers." 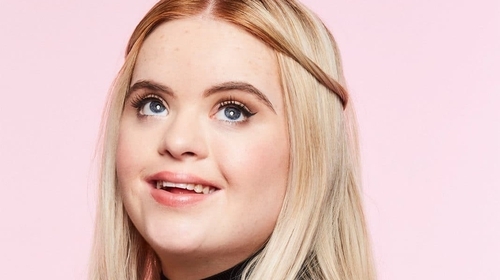 The reason that Benefit Cosmetics choosing a model with Downs Syndrome is so spectacular is because it’s the kind of move the fashion industry needs more than ever, a step towards true diversity and inclusivity. As Deirdre notes, "There’s still a lot of stigma towards people with Down Syndrome". "I suppose with Kate’s determination and her drive and her fabulous personality, she’ll sort of overcome a lot of that stigma once people meet her. As a mum, on a personal level, I just feel thankful all the time. You realise that yes, she has a disability, she has a learning disability but as long as I’m there to help support her and break instructions down and explain things, Kate is grand with that." It’s an unfortunate reality of living our lives so much online that negativity and criticism, in worst cases outright bullying, will try to slip in. However, Kate is surrounded by a "network of support" in her family, with her older brothers monitoring her social media for her. But even if Kate saw any rogue negative comments, Deirdre isn’t convinced she would be fazed. "Kate knows what her message is. She’s very positive because she’s bringing awareness for inclusion for people with disability. But she also knows that because the message is so positive that there’s more positives coming out of this than negatives." "What Kate brings to the fashion world is so much more than the negative and the message she brings worldwide, especially whenever you have a baby and the baby is diagnosed with Down’s Syndrome it can be very isolating. So whenever I see Kate and what she can do rather than what she cant’ do, it gives people so much hope. And this hope Kate is quite aware of and she strives to do her utmost." "She’s such a beacon of hope."